Hello, Friends! 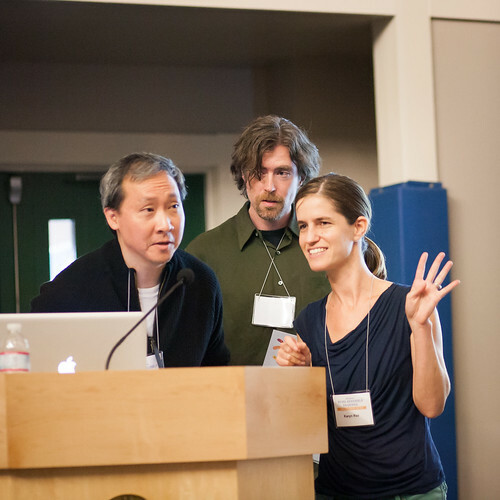 Photos from SCBWI-LA Writer's Days 2014 are up! Click here for the Flickr album, where you can download pictures. Click here for the Facebook album, where you can tag yourselves and each other. 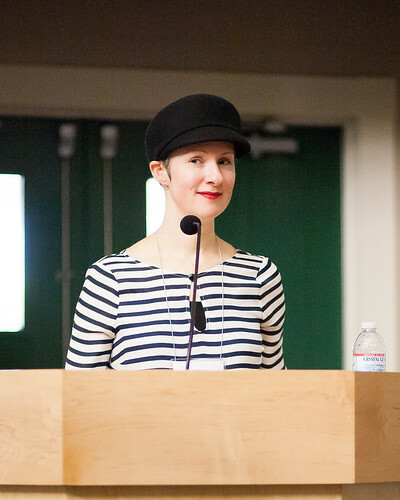 Newbery Award winner Katherine Applegate, "Frog and Toad at The Hunger Games: 10 Rules for Genre Jumping and Career Building from a Seasoned Hack . . . 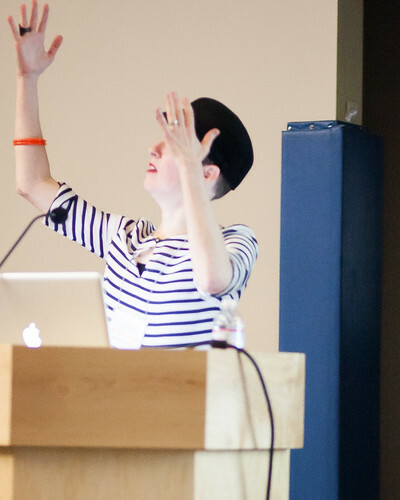 I mean, PRO"
My takeaways from Katherine's talk: She and her husband, Michael Grant, are funny. They used to ghostwrite Sweet Valley High. They gave Jessica her first period. Children's Book Buyer and Author Catherine Linka, "What Every Writer Needs To Know About Retail Book Buying Today"
Look at Catherine's awesomeness. The glasses, the pointer, everything. She's got something to say, and she's going to say it! Catherine's talk was really interesting. She showed how different versions of your author bio get used to convince book buyers to stock your book in stores, among many other things. And she had insight into what book buyers think when they see what's coming out. It's not what you'd assume. Writers doing writing exercises! Every speaker gave one this year. The hand model above is Robin Reul, who later won one of this year's writing contests. Note this hand. It's going places. Jen kicks off her intensive with an example from her favorite movie. and a plotting intensive with Martha Alderson, "The Plot Whisperer," which I attended. Martha Alderson talks about the four energetic markers in stories. I spent a thoughtful five hours analyzing my novel, sitting amongst good friends. It was like a writing retreat! At lunch on both days, everyone made the prettiest little tableaux you ever saw, everywhere, of writers having fun. Seriously, these friends could not have made more diverse portraits if they were posing for Benetton ads. Look at the colors everyone's wearing in both of these pictures above: Red, green, blue. Red, green, blue. Perfect. I remember my glory day (singular) of having won a Writer's Day contest once. That's why I always take pictures of winners getting announced now, no matter how haphazard. That moment glows. Remember that hand in the dark sweater sleeve? Congratulations, Robin!!! Congratulations to all of the winners! 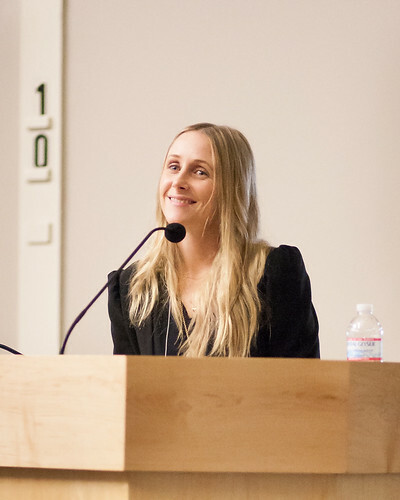 And congratulations to Sally Jones Rogan for winning this year's Sue Alexander Service and Encouragement (SASE) Award. It's well deserved!! 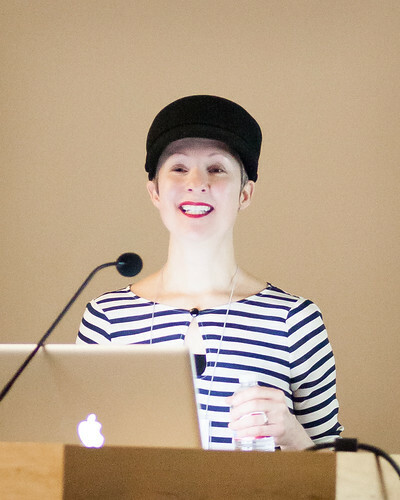 Sally is our new SCBWI-LA Assistant Regional Advisor. She's the best! And so nice. There's a whole lot more, so check out the full album on Flickr here and on Facebook here. This year's Writer's Days was my first significant time away from my baby. I was more nervous about pumping than anything else. But it went great. Sally and Lee and Sarah found classrooms I could sneak off to during breaks. I felt so triumphant each time I had finished pumping for that day, knowing I had done it. I didn't get to pal around as much as usual, at this conference, but I was giddy to be back among writers. Lee gets everyone to sing the names of our respective intensives--"Plo-t!" "Novels!" "Picture Books!" etc.--in harmony, using a pitch pipe app on his phone. This doesn't exactly illustrate what I was just talking about, but he's giddy, too. Even more amazing, everyone knew about my baby and asked after him, and commented on photos I've posted to Facebook. I've tried not to post a lot, but there you have it. We are one big happy family. Topanga Maria with my baby, after my husband brought him to pick me up Sunday. This guy has a following! That is some crazy shiz, social media, that you can bring the whole world in, when I feel like I've fallen out for a little while. Me and the indomitable Greg Pincus, my original carpool buddy for SCBWI events--and this year's Writer's Days social media guru. His book, The 14 Fibs of Gregory K., just got announced as a Crystal Kite Award finalist! 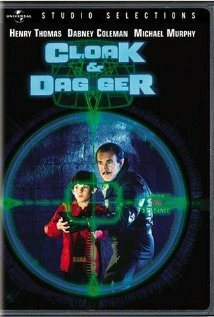 Damon and I rewatched Cloak & Dagger this weekend--the 80s movie starring "Elliot" from E.T. That movie is amazing! It holds up, every ounce!! Damon guessed it wouldn't, and he was so wrong. This is the best thing I've seen in a long time. The stakes were life and death. The tension was smart, with genuinely scary twists. This movie totally explored the limits and advantages of being a child in a grownup world with non-kid-friendly rules--which fits the story perfectly, since our kid hero's mother had died and he was being forced to cope with that. And the movie never talked down to you. It played out exactly as shocking and "real" as I remembered from when I was a kid. We had watched a terrible movie the night before, which shall go unnamed, that explored a similar, nearly universal theme of having a child main character struggling with a parent. In that movie, as the child went through an incredible adventure, he tried to tell his parent but wasn't believed. In Cloak & Dagger, not-Elliot also tries to tell his dad what's happening, and also isn't believed. In the terrible movie, the resolution had Damon and me writhing in our seats. The father basically said, head-on, at the end, "If I ever not believe you again, kick me, won't you?" AARGH. THAT'S TOO DIRECT. the father finds out without the kid even there to say "I told you so." The father finds out with life and death consequences hanging in the balance, which are the direct result of his having not believed. It's so validating and satisfying--and he doesn't have time to dwell on the fact he was wrong; he has to do everything his power to make it right, right now. That's what we as children want! Get to it, man! Your not believing has almost killed me! That's almost like what happened in the terrible movie . . . except that the life-and-death climax, wherein the father also tries to save the son's life, is almost completely irrelevant to the facts the father hadn't believed. There were really two stories: the father-son story mixed up with the fantasy, and then a side story with a villain. That's why they needed a last scene to talk it out. Cloak & Dagger makes me want to write a movie just like it. Or, not a movie. A kid's book. Addressing these age-old themes of getting validation from your parents, childhood vs. adulthood, fantasy vs. reality. They can be done well!! I didn't know how well until I saw this. The annual, four-day SCBWI Summer Conference starts tomorrow! For some of us, it starts tonight—with some pre-conference karaoke (woo hoo!!). And for some, it started yesterday. But I'm not attending this year! For the first time in over a decade. Because I'm pregnant. Due in a few days. But, the baby isn't here yet. So now, in addition to karaoke-ing tonight, I'm hoping to stop by and say hi to many good friends, get coffee, hang out . . . The other reason I'm not officially attending the conference this year is that SCBWI discontinued my Summer Conference photography arrangement with them of several years. It's nothing personal. There have been some shifts in the main office, and the new crew is not as aware of the work I've done for them, alas. But the fact that I'm pregnant is a much more cheerful reason. I will see many good friends at karaoke tonight—woo hoo!! My husband is bringing our new video camera, hoping to capture me shaking this pregnant belly to some hip hop (which is so wrong). This will definitely be his last chance. Unless . . . 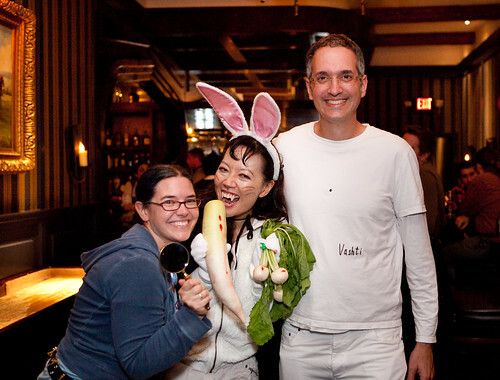 I make an appearance at the SCBWI party Saturday night . . . ?? This year's theme is "Black and White," and this body would make a perfect penguin . . .
P.S. Time permitting, I may still post a few informal pictures from around the fringes of the conference, afterward. There look to be some promising goings-ons this year. Okay, but seriously now. I need to solve my book's problems now. "I just couldn’t get this book under control. It was like a marathon. A blood-stained marathon." "I’d write 10 chapters about three characters but those chapters left two other characters out in the cold. I’d run myself into a dead alley and I’d have to tear them up. I felt so stupid." "I love making up characters. I could make up characters till the cows came home. Plot’s what hard. Very hard. . . . [I]t nearly killed me." Would you rather be writing fulltime? No, I wouldn’t give up the children. They are an inspiration to me. Of course, as I continued reading that last paragraph it hit me that Ms. Schlitz was referring to her job as a school librarian, not children's she had. It was so much funnier when I thought she meant her biological children! And I was relieved when I thought she meant that. I guess the secret's out now: I'm pregnant. So the idea of juggling new parenthood with writing has been on my mind a lot. Anyway, you should read the whole PW interview with Laura Amy Schlitz. Her talking about blood and pain is encouraging. I love, love, love Ms. Schlitz's A Drowned Maiden's Hair: A Melodrama and can't wait to check out Splendors and Glooms. I can't believe I haven't read it already! I've been working on this book a long time. A long time. A . . . long time. I've been working on the same problem in this book for a long time. And trying to see if there's a way to write the book without solving it. And taking breaks from it. Taking walks. Showers. Vacations. Ice cream, cookies, exercise, journals. Just, generally, holding it together. I have great writing groups, friends, family. I have my health. I'm counting my blessings. Someday I'll figure this out. But not today. Again. 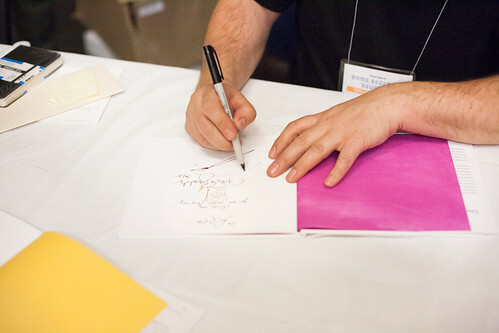 Photos from this year's wildly successful SCBWI-LA Writer's Days conference on "Diversity" are up! SCBWI-LA Writer's Days 2013: "Diversity!" 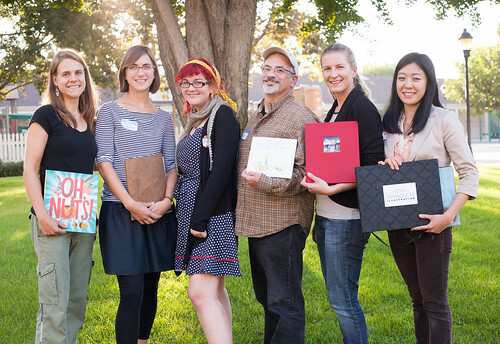 Lovely contest winners from this year's SCBWI-LA Writer's Days. 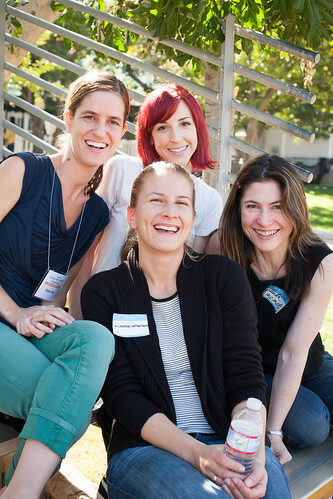 From left to right, top row: Lori Snyder, Erin Fry, Mary Williams. Second row: Christine Bernardi, Judy Kay Slowey-Sly, and Axie Oh. You can view the full set from both Saturday and Sunday on Facebook here, or on Flickr here. From Flickr you can download the image files directly by clicking "Actions"-->"View All Sizes"-->and then selecting the size you need. Please credit Rita Crayon Huang if you use any of these on your Web sites, blogs, Facebook, etc. If anyone wants the full-size originals--like, if you wanted to print specific photos out--contact me and I'll send them to you directly. Thanks, and enjoy! 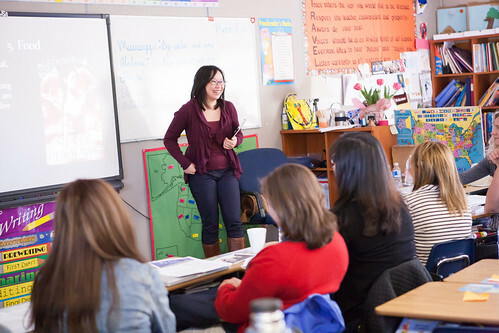 This was the second year SCBWI-LA has added Sunday intensives to Writer's Day, creating Writer's Days plural--a full, weekend event. I took the World Building intensive on Sunday, along with several good friends (and we all did the reading quite diligently). The class was called "Setting As Character: Building Your World," taught by Malinda Lo, and it was super helpful. I loved how you could tell that everyone in the class had come ready to roll up their sleeves and work. Everyone's comments smacked of experience. Thank you again to all of the hardworking volunteers who participated, and most of all to Lee, Sarah, and Sally Jones Rogan for putting on a spectacular two-day event! I really learned a lot and had a blast doing it! 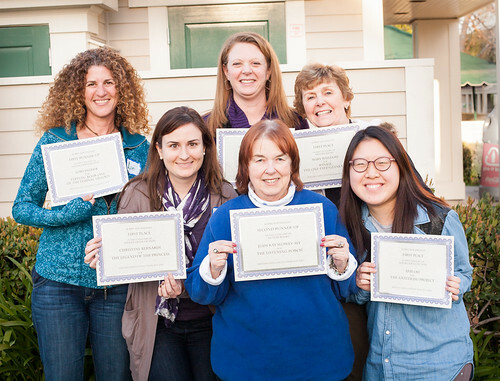 And congratulations again to all of the contest winners--and to Sue Welfringer for winning this year's Sue Alexander Service and Encouragement (SASE) Award. And to Edie Pagliasotti for winning a special SASE Award. Last partyers standing! 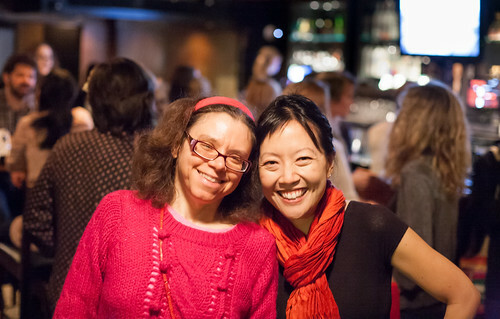 Closing down LA Kid Lit Holiday Happy Hour 2012. Others have posted their pictures at the Kid Lit Holiday Happy Hour--and Book Drive!--2012 Facebook page, so check those out, too. And Karol and Charlie will still be collecting books for the book drive at tonight's SCBWI-LA Westside Writers Schmooze in Santa Monica. 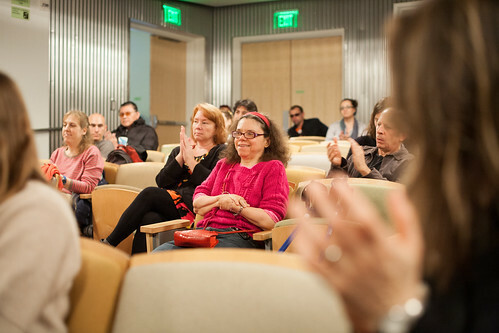 I also took a few token shots at the screening of Library of the Early Mind that happened just before this, at the Santa Monica Public Library just a couple blocks away. I was so happy to see this film at last--and to see so many familiar faces gathered there! 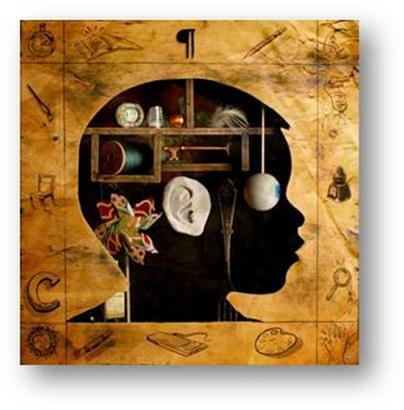 Free screening of Library of the Early Mind, a 2010 documentary exploring the art and impact of children’s literature on our kids, our culture, and ourselves. Above, Lee offers a few words of introduction on behalf of SCBWI Los Angeles, who co-sponsored the event with the Santa Monica Public Library, and Karol gets mad props for making this screening and partnership happen. "Thank you again to the Westside Writers Schmooze (Karol and Charlie! ), SCBWI-LA, and the Santa Monica Public Library for putting this together. Those of you who didn't make it, don't despair. Apparently you can also watch this movie on Library of the Early Mind's Web site--for a $5 rental fee. :) But it was so great to watch it with this vibrant group!" Happy Holidays, Kid Lit Community!! P.S. Special thanks to D for helping me decorate boxes for the holiday book drive, engaging with the movie (yay! I'm glad he liked it! ), and then keeping me supplied with food and drinks throughout the Happy Hour, when he knew I would be too scattered to feed myself. I'm lucky, I know. 05:10 pm - This Dec. 1st: Kid Lit Holiday Happy Hour, LIBRARY OF THE EARLY MIND, & Apocalypsies Book Signing! Just wanted to let you all know about three (3) exciting children's book events coming up on Saturday, Dec. 1st, open to all. 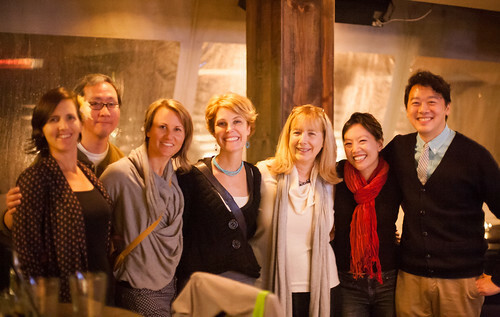 is taking place at Wokcano in Santa Monica on Dec. 1st, from 4 to 7:30 pm. 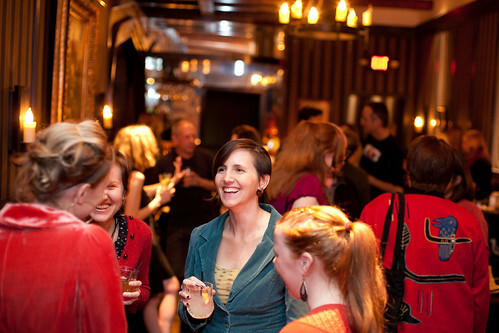 An informal mixer with holiday cheer. Come socialize with fellow creators and lovers of children's books! And bring your unwrapped, new and gently used children's books (board books through YA novels)! 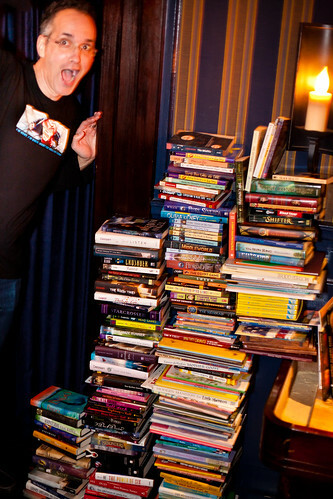 Visit the "Kid Lit Holiday Happy Hour--and Book Drive!--2012 Facebook page for more details on this year's event. Click images above to view pictures from last year's Kid Lit Holiday Party and Book Drive. It was super fun--and produced a lot of holiday cheer for children in need! 2) This year's party immediately follows the nearby, FREE screening of Library of the Early Mind, a documentary interviewing nearly 40 celebrity children's book creators, at the Santa Monica Public Library Main Branch from 2 to 3:45 pm. Library of the Early Mind interviews nearly 40 celebrity children's book creators, exploring the impact of children's literature on our kids, our culture, and ourselves. The screening is co-sponsored by SCBWI-LA. For details including parking info, visit the "LIBRARY OF THE EARLY MIND - Free Screening!" Facebook page--and feel free to RSVP/"Join." I have been excited about this movie for a long time. By all accounts, it is wonderful. 3) The Kid Lit Happy Hour also follows the Apocalypsies Book Signing Party at Mysterious Galaxy in Redondo Beach from 2:30 to 3:30 pm, where nine (9) of our celebrated local authors will be signing books. Check out the superstar lineup through the link! People attending the book signing party will still have time to come to our Happy Hour, after . . . So come one, come all! These events are open to all who love children's books, so please help spread the word! Many MANY thanks to the organizers--especially Karol Ruth Silverstein this time around, who played an instrumental role both in bringing the screening to our area and getting this year's Kid Lit Holiday Happy Hour and Book Drive underway. Cheers, and have a wonderful Thanksgiving. I hope to see many of you on Dec. 1st! P.S. Feel free to "Join"/RSVP at the above linked Facebook event pages. RSVPs are purely optional, but always appreciated. 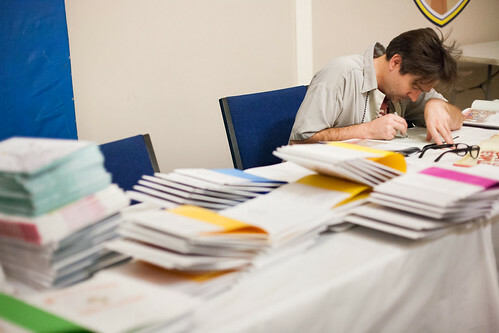 Photos from this year's SCBWI-LA Illustrator's Day are up! Winners from this year's SCBWI-LA Illustrator's Day portfolio and illustration contests. The contest winners look so happy, don't they? 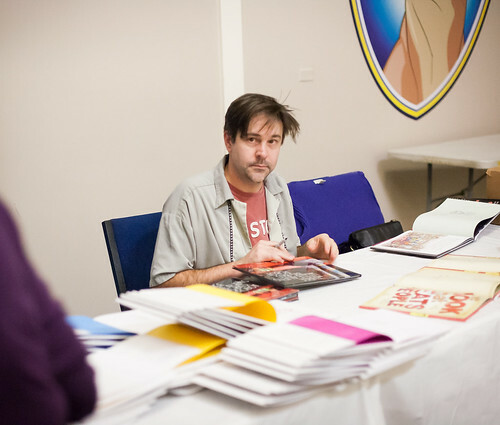 You can see the full Illustrator's Day photo album on Facebook here or on Flickr here. As always, please include a credit if you use any of these images on your own media. Thanks! To see illustrations entered into the contest, including the winning pieces, check out SCBWI-LA Illustrator's Day's Facebook page, or go directly to the Facebook Illustration Contest album. Most people don't realize these pictures are taken in the dark (I hope). "I can see your halo (halo, halo . 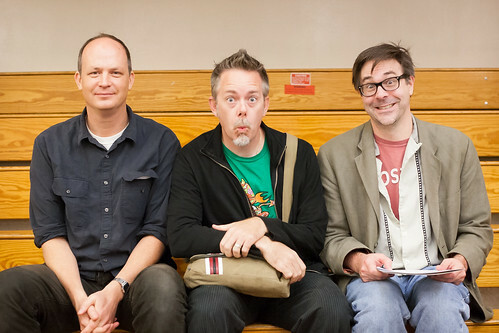 . . )"
This picture of Dan Krall, James Burks, and Mark Fearing from the early morning made me laugh. They look like the Three Little Monkeys--See No Evil, Hear No Evil, and Speak No Evil--except they didn't put up their hands! Which little monkey is which? It doesn't matter, because these three see, hear, and say everything. Mary Peterson spotted me taking this photo and gave the grouping another name, which I won't repeat here. She's hilarious. Looks a bit like juggling . . .
And lion taming . . .
Plus being a ringmaster, and Awesome. Seriously, though, at one point someone said something that was unintentionally awkward and Ms. Harte answered in a way that played that up, which made it funnier. And then she . . . *ahem* mimed opening a door and walking right through it. And I was like, Can those skills be accidental?? These thoughts led me to include one more picture at the end of the album that I normally wouldn't--but, this time, couldn't resist. Am I allowed to post funny pics of luminaries I don't know? I also had a good time taking pictures of friends all day long, like my good pal Mark Fearing, who gave a talk on digital apps. Mark giving his "vignette" on creating apps, aptly named, "App talk"
He is a very serious author/illustrator. I also loved Dan Krall's opening talk, "Look, No Hands (or How I made a career in illustration without ever learning to draw hands)," which was so, so great. He said some things I really needed to hear right now with my work, about how if you really focus on conveying your ideas well, people won't notice your shortcomings in craft, that maybe you've been obsessing over for way too long. I especially loved the graph Dan made tracking artistry (along the vertical axis) to age (along the horizontal), showing his personal journey. It was hilarious and felt true. There were a lot more funny moments and celebrity sightings (Hi, Peepy! ), so check out the full album. If you come to SCBWI-LA Illustrator's Day, you, too, can have this much fun! And hang out with beautiful women. for doing a stupendous job of putting Illustrator's Day together. Our three fearless Coordinators thank each of us, even though we need to thank them! 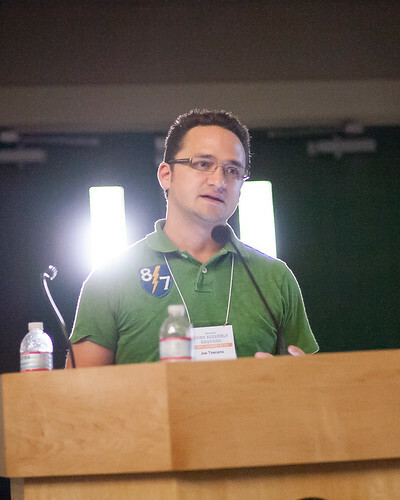 Thank you guys for creating an amazing conference, and thanks for letting me participate, too. I love hanging out with all of you! At the very, very end of the day, Mark Fearing lent me money so I could buy a copy of Peter H. Reynolds's Ish and get it signed. 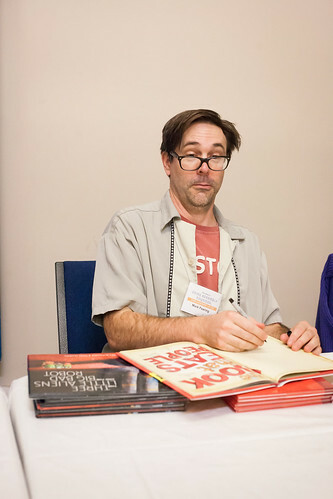 Peter H. Reynolds signs my new copy of Ish at SCBWI-LA Illustrator's Day 2012. Mark, I still owe you a dollar! 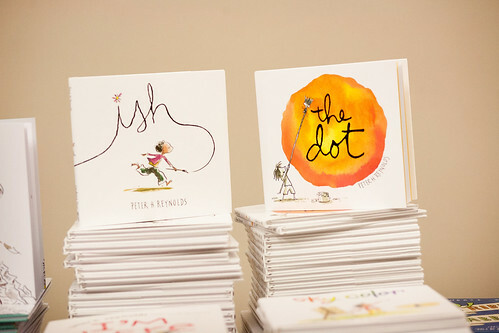 Ish is a sequel to The Dot, which I already love and had brought my copy from home to get signed. The Dot is about getting started as an artist. 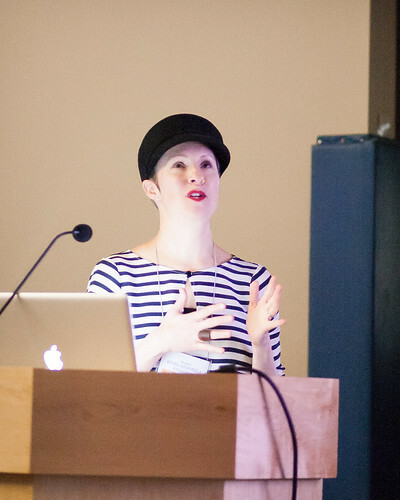 Ish is about giving yourself permission to not do everything "perfectly"--to keep going. As with the message from Dan Krall's morning talk, this was something I needed to hear right now. 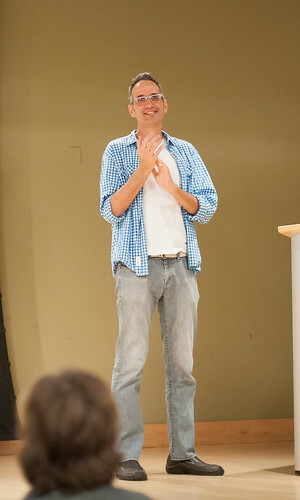 (Peter H. Reynolds read Ish to us during his end-of-the-day talk.) 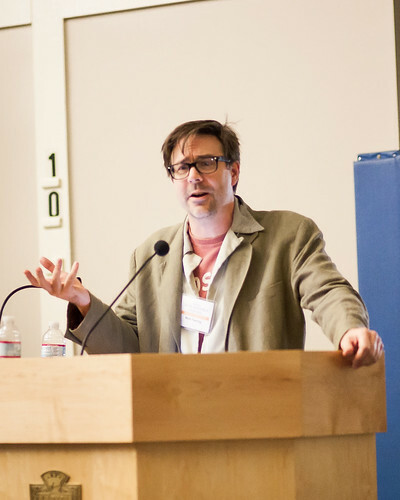 I also chatted with Mark Fearing and Andrea Offermann on this subject, afterward, so thank all of you so much . 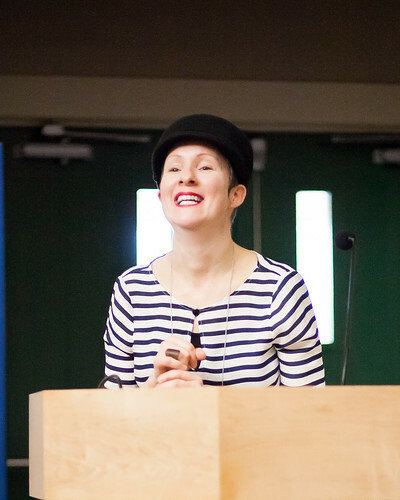 . .
Did you know there's a collection of my SCBWI event photos on Flickr? Click on the image to visit my SCBWI Events Collection on Flickr. Dan: "A photo from the Nobel Awards or the Super Villain Conference, I'm not sure which."